Forget about having to conjure up sophisticated strategies to succeed in mixed martial arts. UFC middleweight Chael Sonnen (Pictured) claims even the biggest moron can excel in fisticuffs. “I hear guys talking about strategy and specific training, I don’t even know what that means. You just show up for practice and practice every day,” Sonnen expressed. “I hear guys sit around and talk about their strategy and their game plan. I’ve even heard guys say stupid things like ‘foot work.’ Do you know what that means? It means the way that your feet move. Who cares? Did you catch that Greg Jackson? The endless hours have you have spent creating complicated strategies for your athletes has been an enormous waste of time. According to Chael P. Sonnen, it’s not about the X’s and O’s, it’s all about exchanging blows. 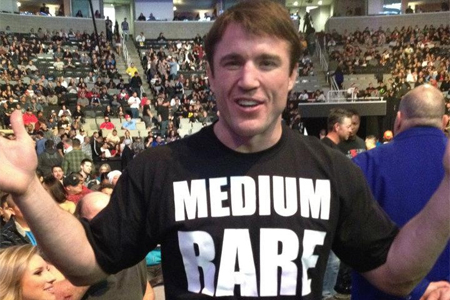 “[Fighting] is the most simplistic, unintelligent thing two people can do,” Sonnen flatly stated. Sonnen meets Michael Bisping this Saturday at “UFC on FOX” to determine who gets next dibs at Anderson Silva’s middleweight crown. The show takes place inside United Center in Chicago, Illinois.